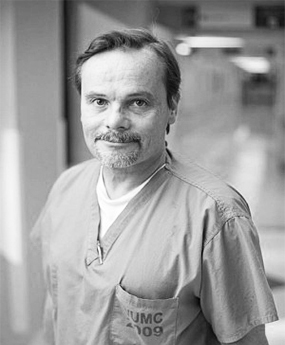 Dr. Roger R. Dmochowski is Professor at the Department of Urology at Vanderbilt University in Nashville. He is Director of the Section of Female Pelvic Medicine and supervisor of the Fellowship in Pelvic Medicine at Vanderbilt. He is also Clinical Assistant Professor in Surgery at the Uniformed Services University of the Health Sciences in Bethesda, Maryland. He is also Vice Chair, Section of Surgical Sciences Vanderbilt University Medical Center, Associate Director of Quality and Safety, Vanderbilt Health System, Executive Director of Risk Prevention for Vanderbilt Health System, Executive Medical Director for Patient Safety and Quality (Surgery), Associate Chief of Staff, and Medical Director of Risk Management at Vanderbilt University Hospital. Dr. Dmochowski received his medical degree from the University of Texas Medical Branch at Galveston. He completed an internship and residency in surgery and urology at the University of Texas Medical School at Houston and at the M.D. Anderson Hospital and Tumor Institute in Texas. In addition, Dr. Dmochowski is subspecialty fellowship trained in female urology, neurourology, urodynamics and reconstructive urology. He is board certified in urology and female pelvic medicine and reconstruction. Dr. Dmochowski has published more than 260 articles and 100 book chapters, and 390 abstracts, and has given over 240 presentations at various national and international meetings. Dr. Dmochowski is on the editorial board for the World Journal of Urology and Neurourology and Urodynamics, and he is a reviewer for the Journal of Urology, and Urology. He is the incoming Editor in Chief of Neurourology and Urodynamics. He is a Fellow of the American College of Surgeons and a member of the American Urological Association and International Continence Society. He is a trustee of the American Board of Urology. Dr. Dmochowski has been granted the Zimskind Award from the Urodynamics Society for his accomplishment in clinical treatment for incontinence. His current research interests are outcomes of incontinence therapies with a particular emphasis on quality of life issues. He also is active in bio materials evaluation.